Welcome to the Monday launch window at Emerald Hill. Ron and Steven set aside time this day to walk the house together for the first time since Steven returned from ShowStoppers @ CES in Vegas. That was the plan. 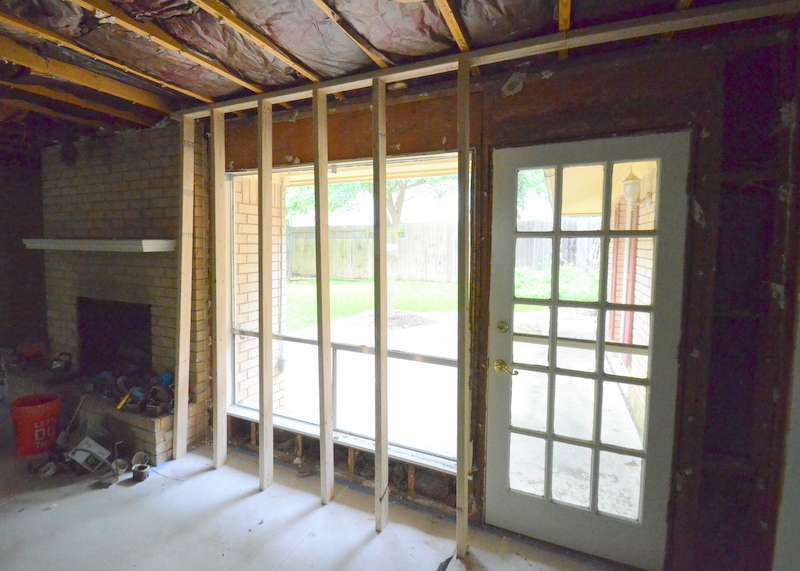 We did work through a long list of open items — garage lights, framing, electrical, plumbing, pending inspections, drywall seams opening up, why the drywall is cut open in several locations. 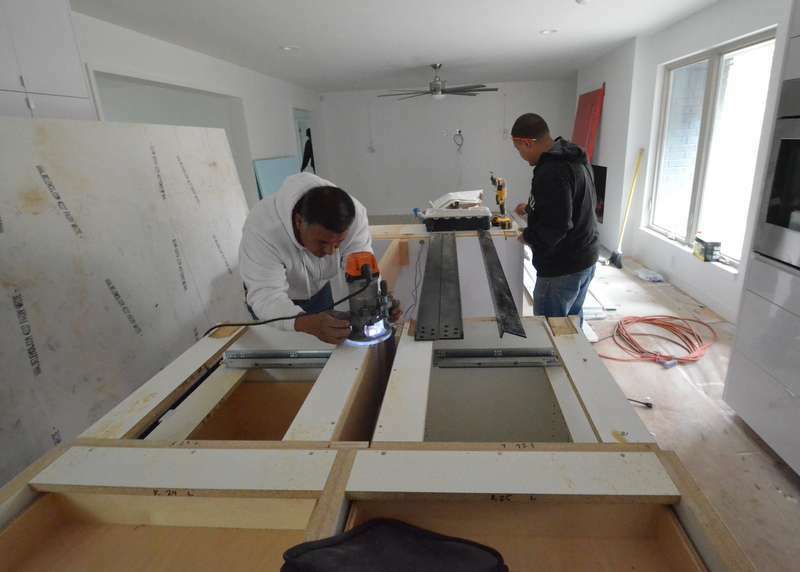 Then the install crew for the countertops arrived. At first, Miguel, Saul and Luis buzzed through the to-do list. Saul routes into the cabinet a wider channel to seat the bracket into while Miguel preps the undermount bracket at the east side of the island. 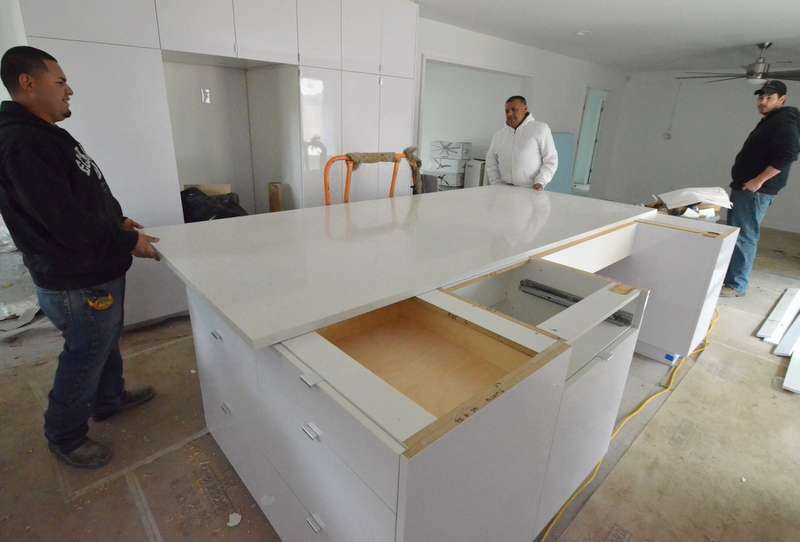 Plans call for 4 brackets spaced across the width of the island, to disperse and support the quartz, protecting it from collapse and breaking. 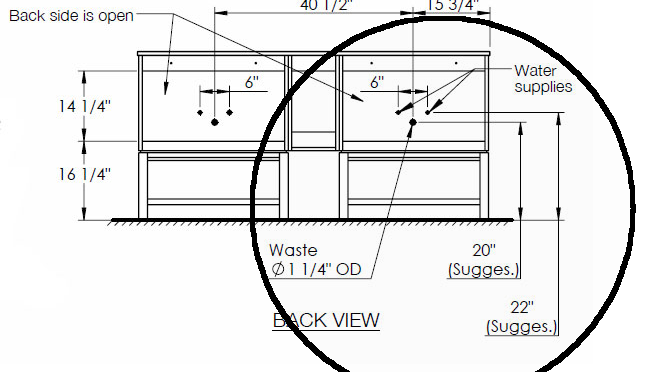 Steven stepped out of the kitchen to talk with the structural engineer inspecting the garage framing, came back into the kitchen, and stopped the work. 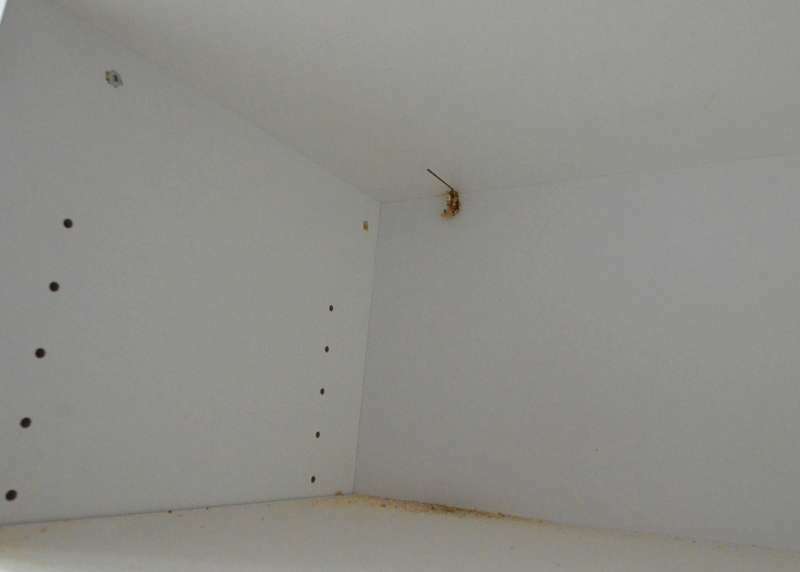 The install team sliced into the shelf cabinet at the end of the island — and through the cabinet. This is the cut to the cabinet where Steven stopped the adventure. This is the slice from underneath. Steven called Ron. Twice. Texted a photo of the damaged cabinet. 30 minutes went by. Ron called in from his truck, 20 minutes out from Emerald Hill. We waited. MIguel called Austin Stone, supplier of the countertop. Ron arrived. He put the bracket install on hold pending inspection of the cabinets by Aaron, the cabinetmaker, aiming at tomorrow/Tuesday. 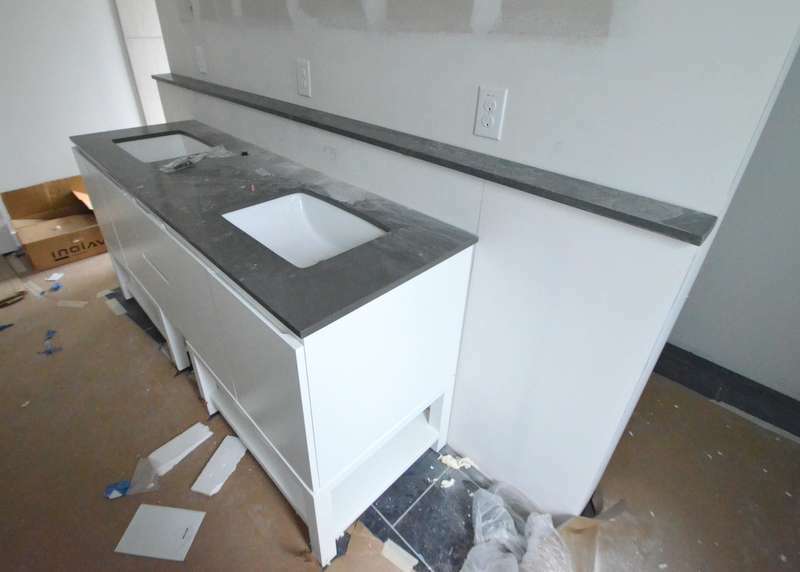 In the interim, the install team removed the brackets, placed the countertop back atop the base cabinets. Next, working with Ron and Steve the electrician, Steven and Miguel measured precisely where to locate the Haefele electrical outlet that will pop up through a hole in the countertop slab. Steve the electrician doublechecked the outlet and electrical supply. We measured one position five or six times. Steven walked around it, thinking, testing the length of the reach from the end of the island. Too far. We shifted it closer to the end. Steven approved. We triplechecked the position. Again. Steven approved it. Again. 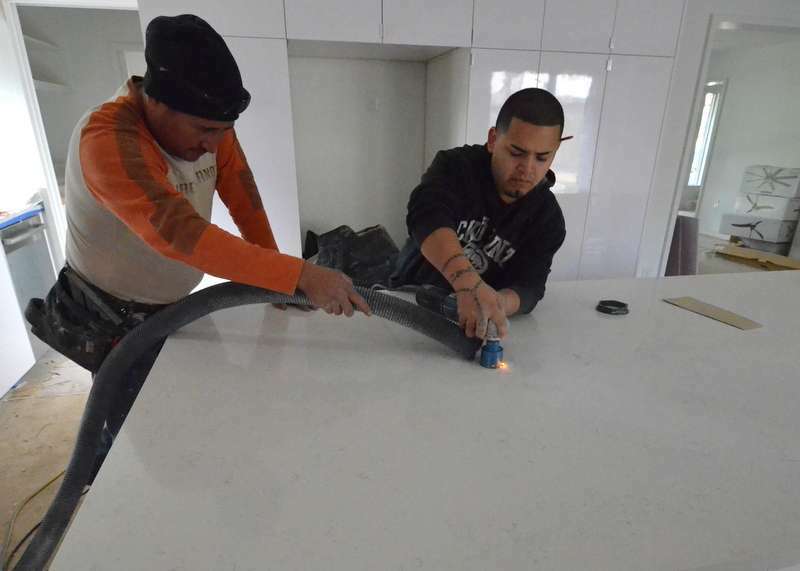 Miguel drills the countertop for the electrical outlet while Luis suctions away quartz dust. Which is when Steven left, making sure that Ron would continue to supervise. Steven did not travel to Emerald Hill yesterday, 8 December. Instead, he wrestled a plumbing mystery at Sea Eagle with help from Albert and his son Cory, dispatched by Barry at Custom Plumbing. For the past three weeks, the shower in the master bath has been luke warm. It starts out hot, but quickly fades in a minute to warm. The water is heated by the new tank installed back in July by Barry. 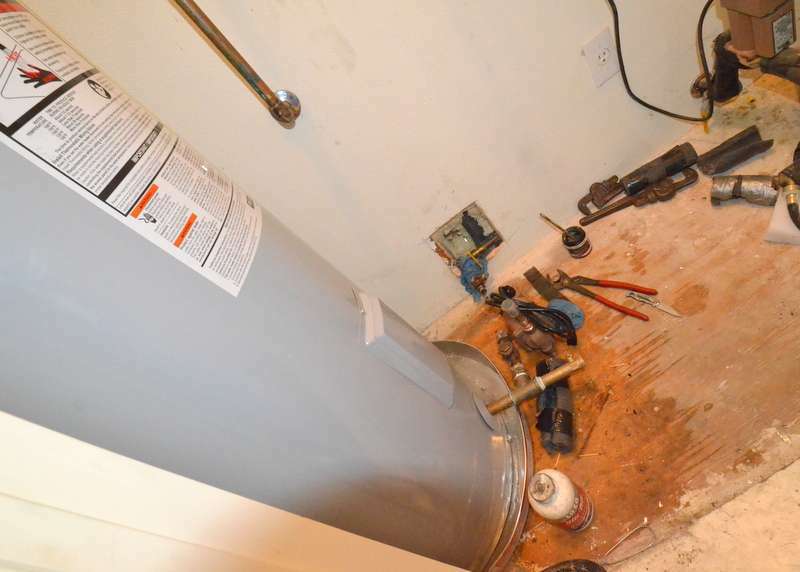 In October, the water heater tripped the circuit breaker. Steven reset it. We went back to normal. We woke to no hot water on 16 November. Steven reset the breaker — and we had hot water. By 30 November, the tank was generating only lukewarm water. Barry asked Steven to replace the breaker, thinking the problem is electrical. Scott from Capstone inspected the breaker, did not see a fault, replaced it anyway. Steven and Jacquela tested this new configuration for several days — and on 5 December requested that Barry inspect the tank and, possibly, replace the heating element inside the tank. Above, Barry discovered two problems. 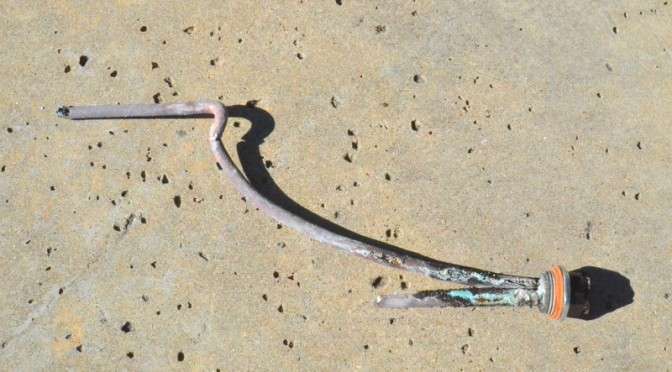 First, that snake-like assembly is the upper heating element from the water tank. It is fried. That explains why the tank was generating only lukewarm water, relying on only the lower heating element. The second problem — the recirculating pump would work only if Barry whackked it with his pipe wrench. Hard. We suspect there was an electrical surge or failure of some kind that took out the heating element and the recirculating pump back in October, when the breaker tripped for the first time. Albert drove over to Ferguson’s to purchase a new recirculating pump. He and Cory drained the tank and, by blowtorch, disassembled all the pipes at the bottom of the tank. This is what it looked like when Albert was about halfway through with the blowtorch, taking apart the pipe assemblies and the failed recirculating pump. Albert and Cory buttoned up everything by mid-afternoon and drove off. Steven came back about 8 pm from the meeting of the MUD 5 board — his last as a board member; he resigned. There was a hissing in the garage. He discovered a pinhole leak in one of the solder joints. Steven sent the photo to Barry. Barry called Albert. Albert rolled the truck. Steven tried to stay out of Albert’s way, but instead wound up providing an extra set of hands. 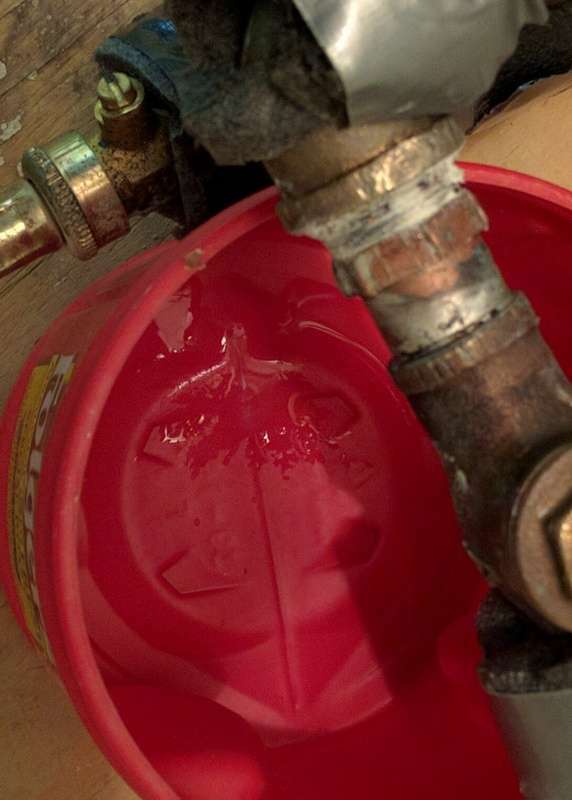 Albert had to turn off water to the house to re-solder the joint — even with the shutoff valves cranked there was still too much water dribbling through the pipe for the blowtorch to properly melt the solder at the joint. Albert also opted to add a second shutoff valve to the bottom of the tank, allowing us to isolate the tank at either end of the pipe run, if we need to cut off the water again, remove the pipe assembly and new recirculating pump, and work on everything away from water. Albert finished after 11 pm. At 1 am, Steven rechecked the work before going upstairs to bed. 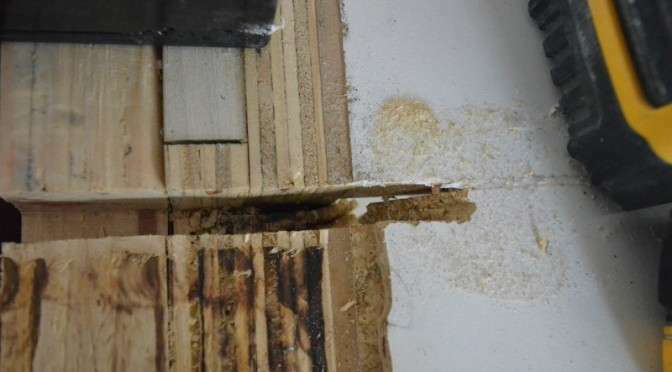 One of the threaded joints appears to have a very slow leak. Steven and Jacquela woke to hot water and a functioning recirculating pump. Steven reported the leak to Barry. Custom Plumbing is scheduled to work on this again Friday, 11 December. Barry sent the bill today. Paris. Sharm el Shaikh. Ukraine. That “nuclear” deal with Iran. Knife attacks. Nail bombs. Suicide bombers. The World Trade Towers. The Supreme Court takes up the Texas abortion law under which religious thugs tell women they have no rights to their fallopian tubes. Religious bigots running for president of the red states. A self-funded blowhard running for president to build a “huge” wall and deport 12 million people. A former doctor who may or may not have tried to stab “Bob” or a relative is running for president. A lesbian couple with two kids is told by a Utah judge they can’t adopt a baby. Today’s discovery: The drain lines for all six bathroom sinks are too low. As built, they will require us to cut apart the vanities to create clearance for the drain pipes. This error will not be paid for by Steven and Jacquela. 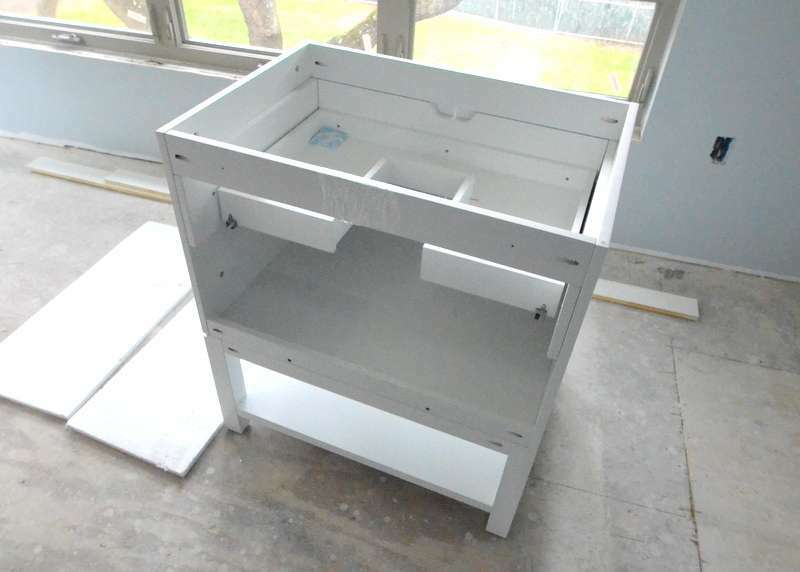 Months ago, when Steven ordered the vanities online, he downloaded, printed and delivered to Ron Dahlke the specs with dimensions for locating the drain and water lines. The instructions were not followed. Above, an excerpt from the spec sheets. The waste line is supposed to be 20 inches off the floor. The water lines are supposed to be 22 inches off the floor. 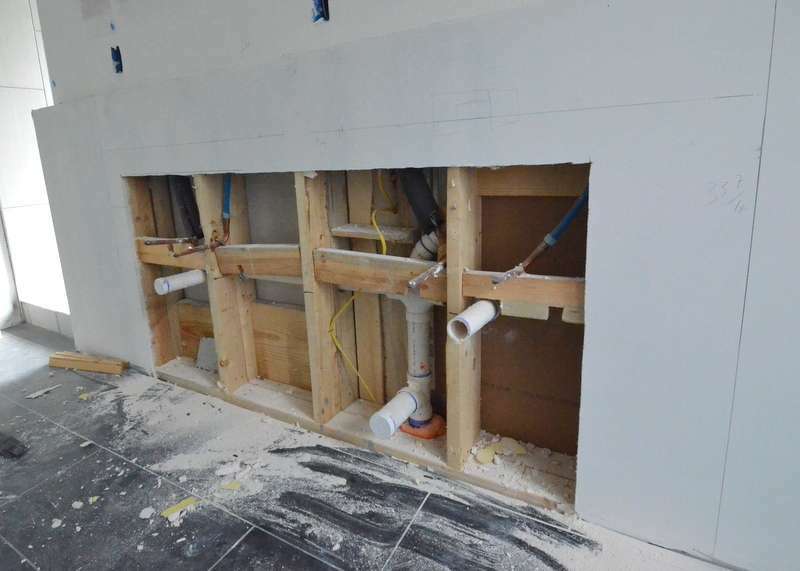 Here’s an example of how the plumbing was installed. The two copper water lines are just about correct, but a little low, at 21.5 inches. 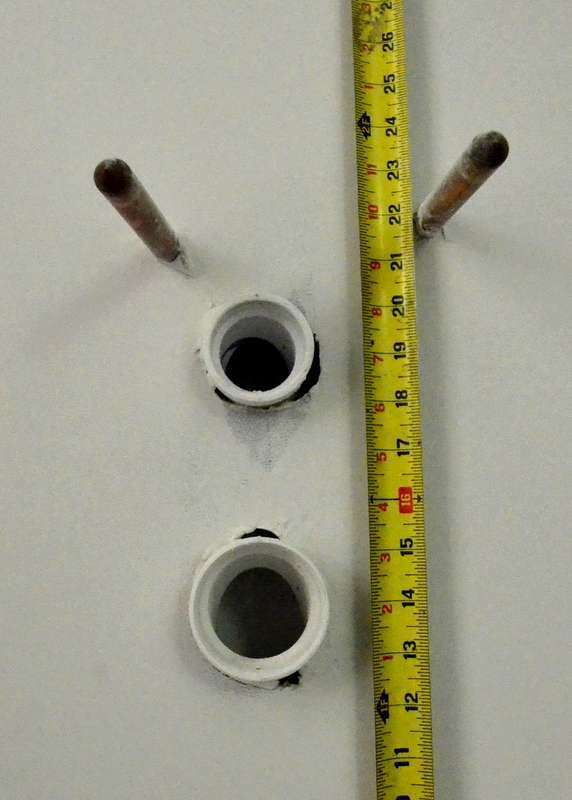 The top white PVC fitting for the waste line is installed at 18 inches off the floor instead of 20. And the cleanout line at bottom is too high — it will be blocked by the shelf of the vanity. For the record, this is one example of six installations. This is the install at the right-hand sink in bathroom 2. 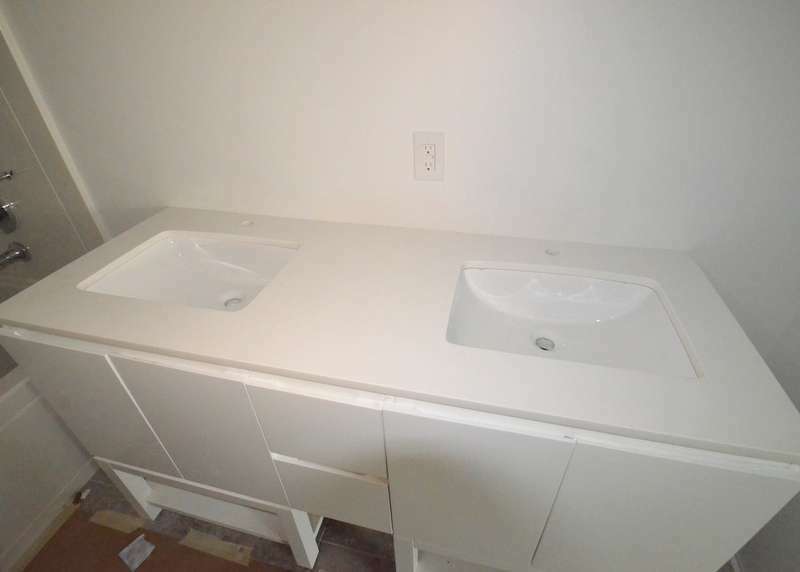 Here is one of the six vanity cabinets that we are using in all the bathrooms. This is the first time the cabinet has been unboxed. Cris was going to install them all today, but … now the plumbers have to fix the installs. The cabinet, by the way, is beautiful and brilliant, chosen well. Here’s the same cabinet, now parked in the master bedroom, exposing the open back. The pipes as currently installed will require us to cut apart the middle shelf of the cabinet — basically destroying it. Steven is adamant that the plumbers should have followed the instructions in the spec sheet and will now have to redo the plumbing. Ron agrees to speak with Barry after Steven and Ron doublecheck the vanity cabinet instructions that have been stored at Ron’s workdesk in the garage. 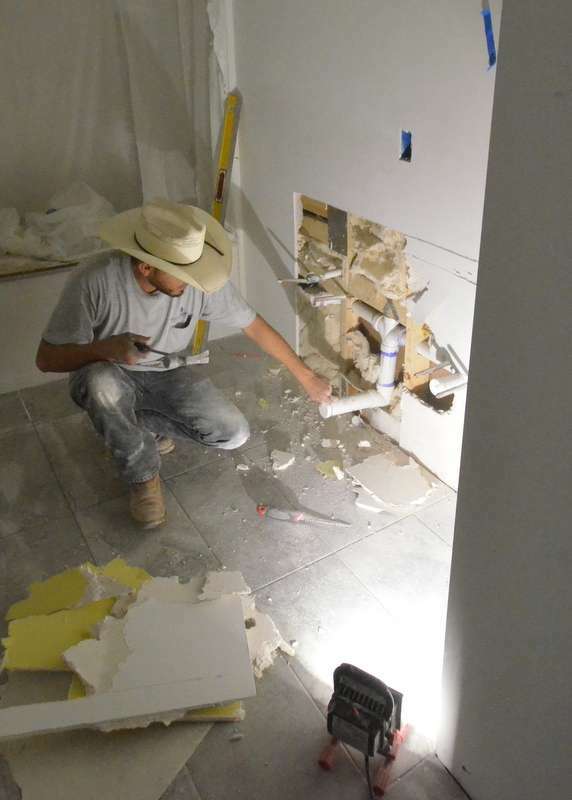 To fix the plumbing, Ron, Cris and the Ranserve team hack away the drywall in the master bath, exposing the piping. And hack away the drywall in bathroom 3. And hack away the drywall in bathroom 2. With irony and good humor, Ron advises that he is happy we made this discovery today, with two months to go until construction ends — instead of having to rip open the house with one week to go before Jacquela, Jadin and Steven move in. Above … Ron Dahlke from Ranserve, left, Steve from Capstone Electric, right, and Steven, not seen, because he is taking the photo, convene for day 2 of the electrical rough-in walk through the house upstairs, in bath 3. See the “can” — a rectangular metal box – mounted at the rafters over Steve’s head. The “can” over Steve’s head is in the wrong location. Instead … see the “can” over Ron’s head at left, and the box for an HVAC vent above where Steve is pointing? All three fixtures should instead align in that one bay between the two adjacent rafters. To make this happen, the HVAC vent needs to shift closer to the can over Ron’s head. Then, on the other side of the vent, opposite the first “can,” Steve has to remount the “can” that is currently located over his head. This second can must be located outside the tub shower that will be installed at the back wall. Why? It’s actually a can that combines both a fan and light. We need two lights to illuminate the bathroom. We need the fan to exhaust humid air from the bathroom when someone is taking a bath or shower. Why this alignment? 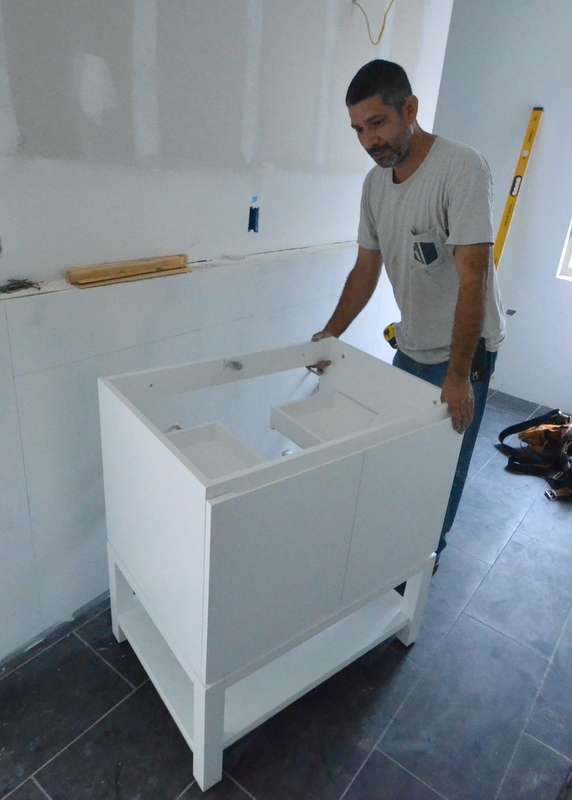 The bathroom vanity will be installed on the wall at Steve’s left elbow. There will be two sinks. 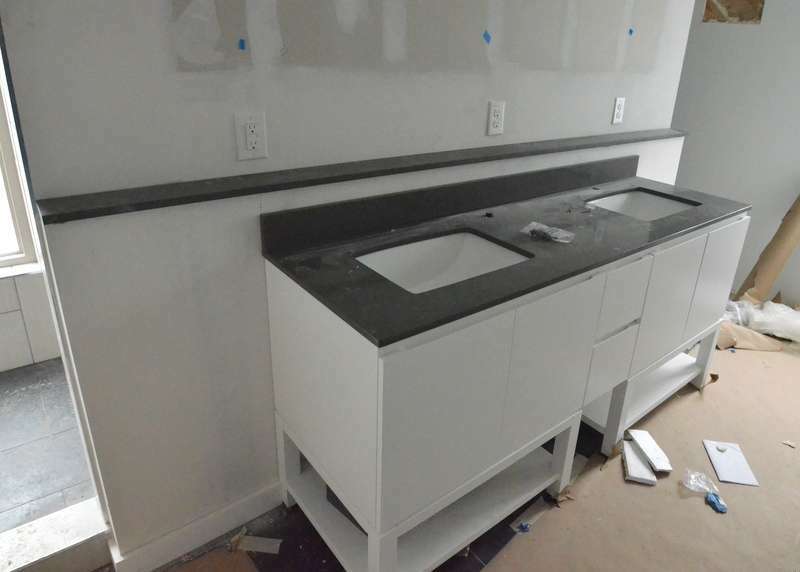 The HVAC vent should be aligned with the center of the vanity, and the LEDs that are to be installed in the “cans” should be aligned with center of the two sinks in the vanity. Meticulous detail. Careful planning. Explanations of logic. Compromises with electrical codes. Step by step, we work this all out over 20 minutes. The PEX line currently runs over two silver HVAC ducts and the exhaust fan duct in the ceiling, potentially restricting airflow. It will be relocated under the HVAC ducts. The fan duct will shift when Steve the electrician shifts the combo fan/light can. Also, Ron is going to audit the installation of the HVAC ducts. Steven sees kinks, compressions that will reduce airflow, and too many ducts crammed into too small a space. From bath 3, we shifted to the laundry/utility room next door, then the master bath. More than an hour later, we made it downstairs. 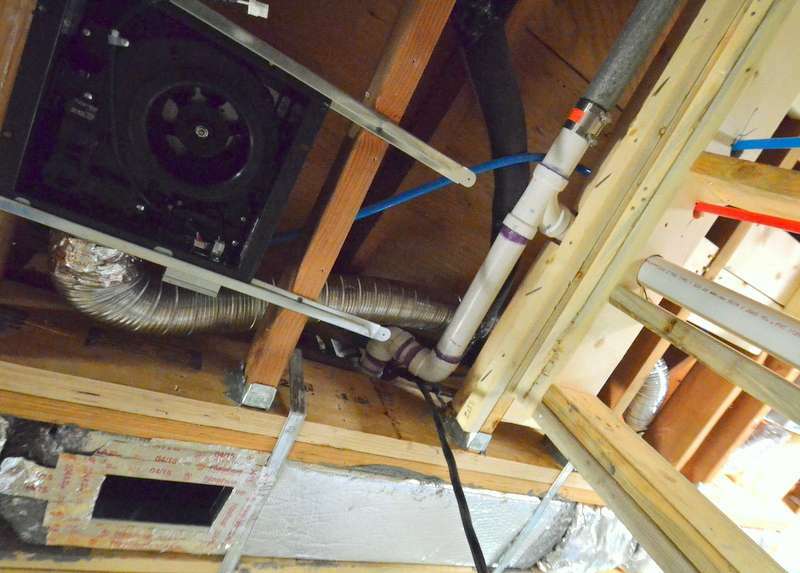 This is the exhaust fan installed in the ceiling over what will be Jadin’s shower in bath 2. It’s not just a can light. It’s also an exhaust fan. With a humidity sensor that automates operation. Take a shower, it turns on the fan and blows the hot, humid air out of the house. When the humidity level drops, the sensor turns off the fan. Human interaction is not required. Which is important, because Jadin is a teen — and teens take long, hot showers. See the silver exhaust duct? It takes a tight 90 degree turn out of the can, which constricts airflow. 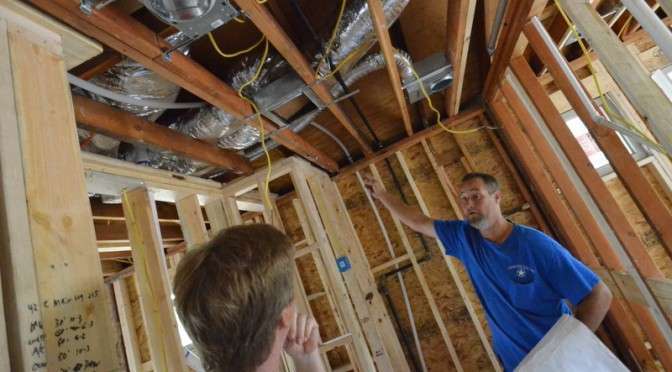 Then the duct rises up to clear a rafter, continues up over a run of pipes that vent the plumbing stack, to provide air behind water — the venting that is needed for water an waste to drain down pipes and out of the house. So far, so good. But … where the duct crosses over the plumbing stack, it dips, and then it rises to the vent stack in the roof, which is where the wet air would vent out of the house. 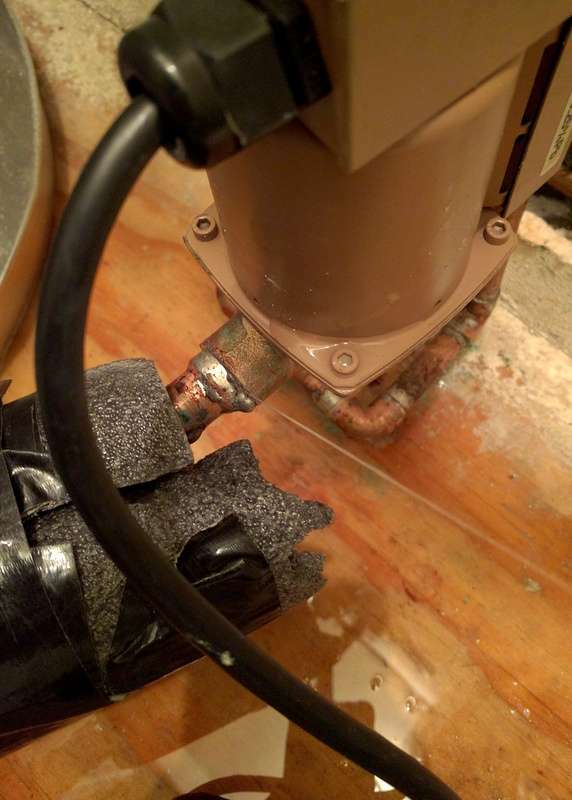 Except … because the duct dips, water is going to collect in the dip, plug the vent. No air is going to escape the house. And the duct will just collect more and more water over time. Ron says he will audit all the HVAC ducting for errors. Ron and Cris from Ranserve pointed this out to Steven. 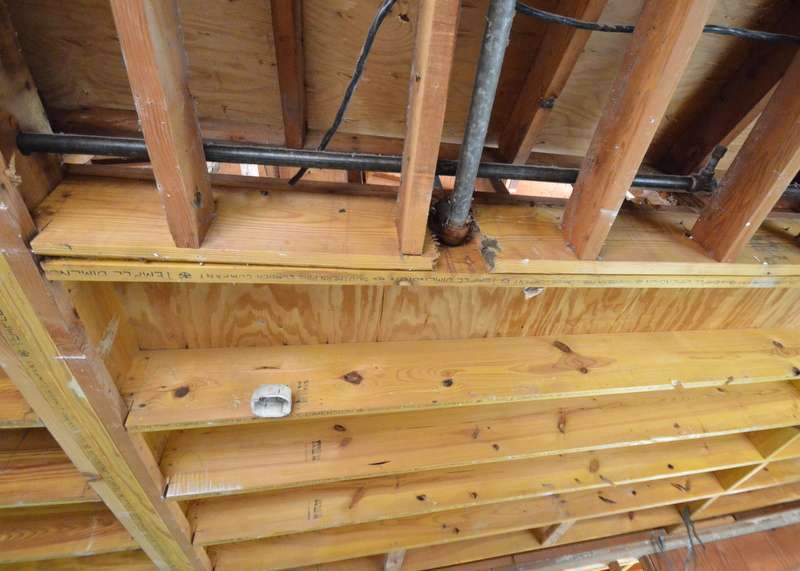 Apparently, when the house was originally built, the plumber drilled through the paired beams that hold up the second floor, above the kitchen, to run the vent stack for the kitchen sink up through the framing to the roof. 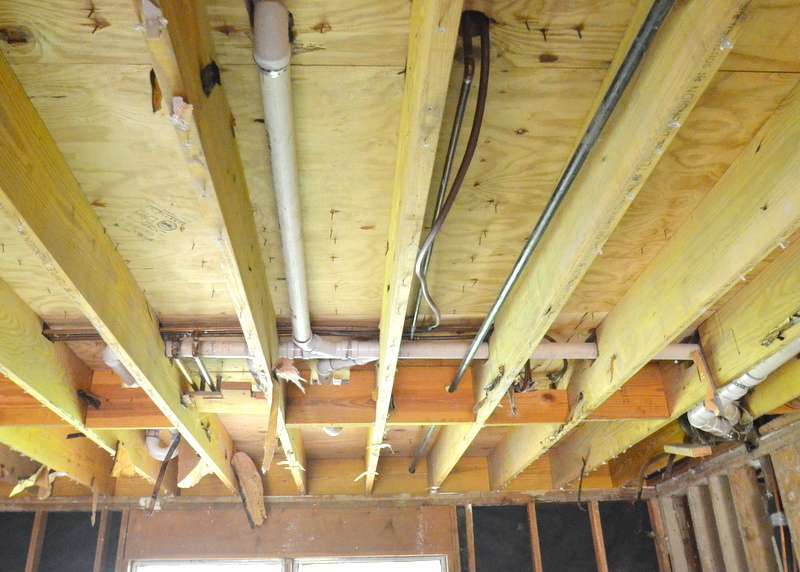 That plumber took out more than half of both of the paired beams. 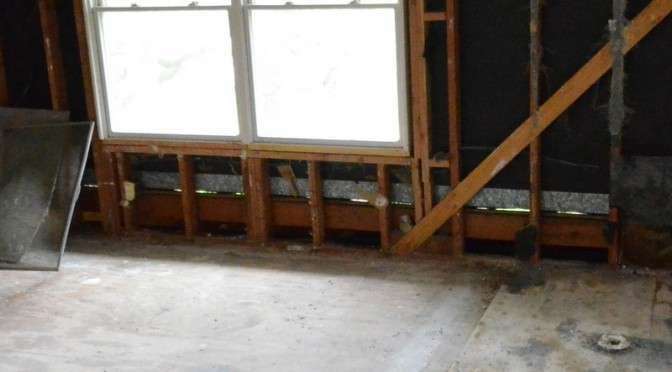 As a result, the second floor at what will be the master bedroom — if you place a golf ball on that floor, as Steven did, that golf ball rolls around vigorously, unable to find anything level to rest on. Ranserve will be fixing this, per the structural engineer, at F and E — see Sketching the structural plan. Compounding the error in the ceiling, the plumbers also compromised the studs that support the top plate when they drilled the studs to run the vent stack into the stud bay from the sink. 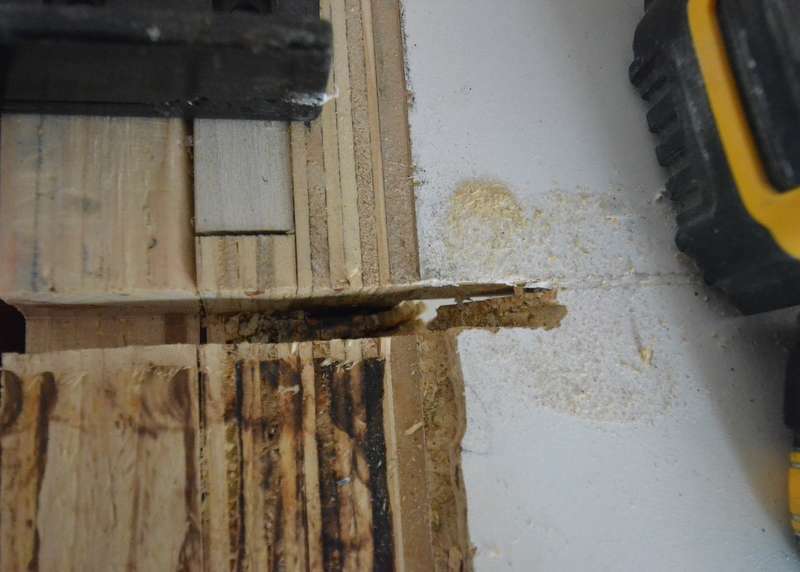 This malice took forethought, because they clearly took the time to drill through four vertical studs and a vertical shim, as if there is never ever a structural reason to nail four vertical studs together. 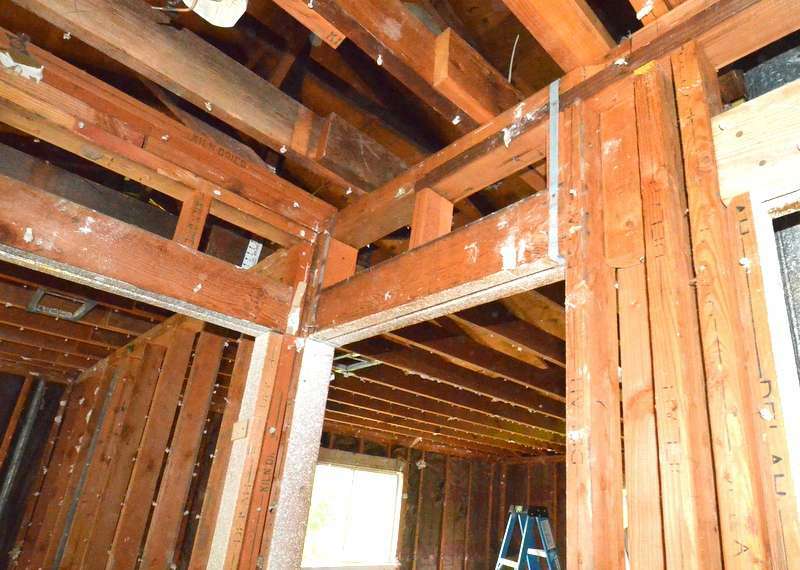 What also amazes is that an inspector approved these errors when the house was built. Ron and Cris advise that inspectors today will “red flag” failures like this. See the horizontal metal flashing that runs across the inside of the exterior wall, about one foot higher than the floor? Light penetrates gaps in the wall under the flashing. In other words, the exterior siding is open to critters, bugs and the elements. This house was not a sealed envelope. Heated and cooled air escaped through the walls. This is not a surprise; it is, instead, another example of why we are taking this house down to studs — find what’s wrong, fix it. This is not permitted by building code today. We did not want to take the house down to studs. The aluminum wiring from 1968 forced reluctant Steven to take that decision early in the planning and discussion phase between Steven, Jacquela, Brett the architect and Mark at Ranserve. Take down all the drywall, remove all the insulation, keep going until you see the whites of its eyes. It’s daunting. It’s expensive. The job evolves to an entirely different order of magnitude. Lesson learned: Never ever buy a house with aluminum wiring. The irony of exposing the entrails is … you get to “save the house from itself,” as Ron told Steven today — the exact phrase Steven used when making that awesome decision to proceed. 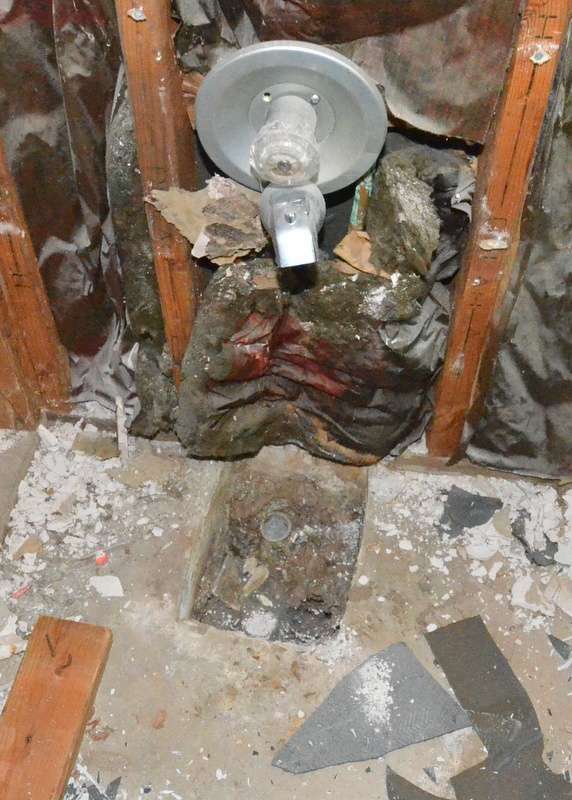 Here are today’s revelations during demo that this remodel gets to fix. No jack studs holding up the header. Instead, the framers opted for metal straps. 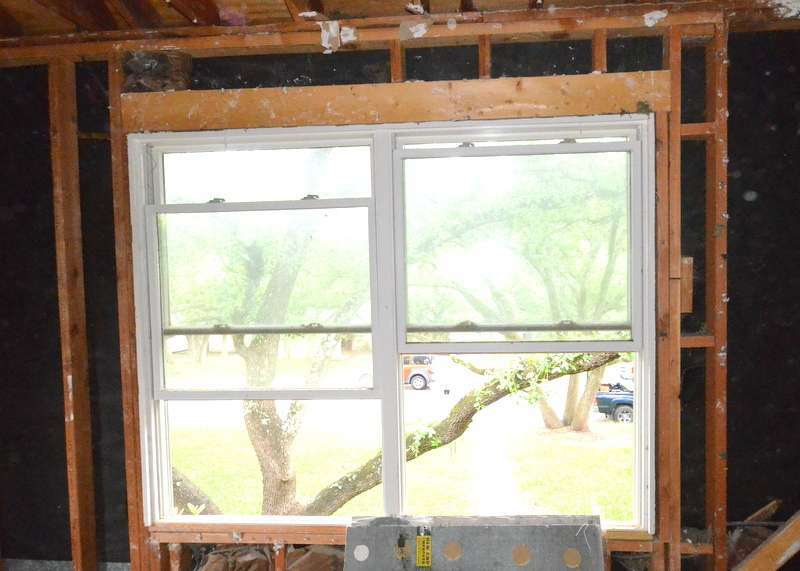 The roof flashing failed at this corner of the house, at what will be the corner of the master bath. Water penetrates and leaks down to the kitchen. Good thing it is raining today, to help spot this mistake in action. Ron tells Steven that this is how they built houses in the 1960s — a hole in the slab, open to the dirt below, through which the builder ran the plumbing. 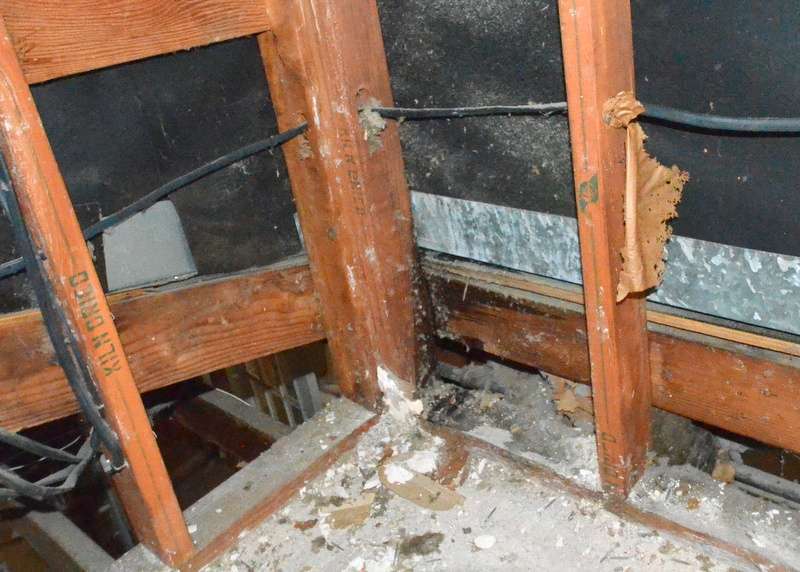 Here’s the highway to termite infestation under what was the tub in bath 2. Steven talked this through with Ron and Cris from Ranserve. 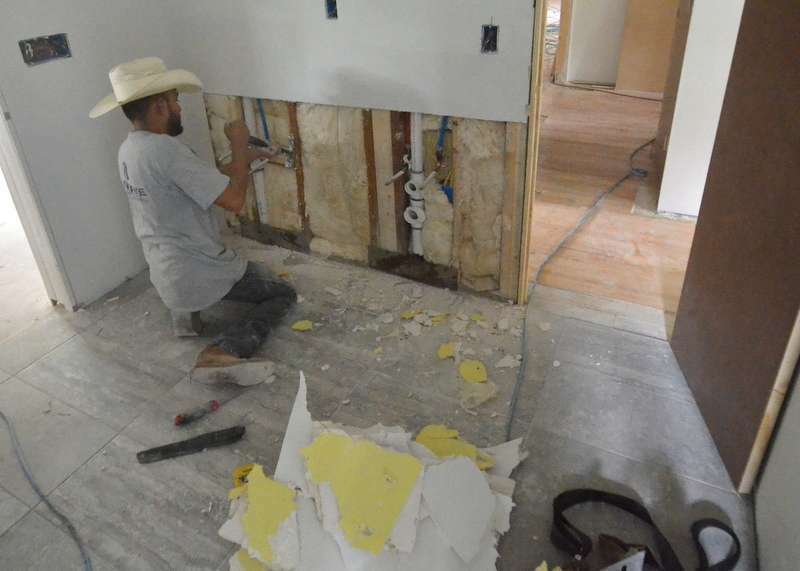 They reassure that they have seen worse, that every house in Northwest Hills would exhibit similar failures if opened up for remodel, that everything here can and will be fixed, that we planned for all this, and the budget funds these repairs. 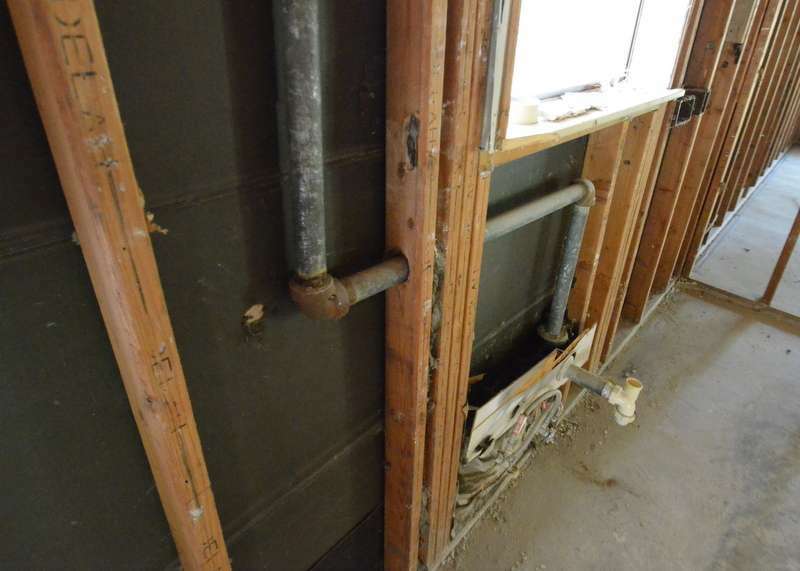 With insulation removed it’s now possible to see just how badly the structure was cut when the upstairs bathrooms were remodeled sometime during the life of this house. At left, the blocking was turned sideways and cut to shreds. At right, the blocking was cut by half. In the middle, the blocking is, well, holed beyond integrity. And the ceiling beams are compromised. Building code today prohibits this. Steven is thinking that taking the house down to stud is a smart decision.